ORNL’s Ilia Ivanov (left) and Chris Tulk (right) in front of the SNAP diffractometer. Photo: Genevieve Martin/ORNL. Unexpected results from a neutron scattering experiment at the US Department of Energy (DOE)'s Oak Ridge National Laboratory (ORNL) could open up a new pathway for synthesizing novel materials and also help explain the formation of complex organic structures observed in interstellar space. In a paper published in Angewandte Chemie International Edition, the multi-institutional team of researchers, led by Haiyan Zheng from the Center for High Pressure Science and Technology Advanced Research in Beijing, China, discuss using high pressures – rather than high temperatures – to initiate chemical reactions. Their research will significantly improve scientists' understanding of complex carbon materials and may also offer clues to the formation of amino acids by non-biological processes. "This discovery was somewhat of a beautiful accident," said Ilia Ivanov, a research scientist at the ORNL's Center for Nanophase Materials Sciences, a DOE Science User Facility. Ivanov traces the discovery back to a neutron diffraction experiment at ORNL's Spallation Neutrons and Pressure (SNAP) diffractometer – also a DOE Office of Science User Facility. While performing a high-pressure polymerization experiment on the chemical compound acetonitrile (CH3CN) using the SNAP instrument, researchers detected the unexpected presence of ammonia. Ammonia is a colorless gas but has a very distinct odor that can be detected in even minute quantities. 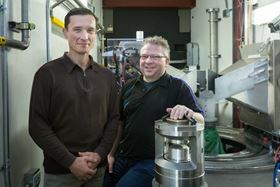 "If you put acetonitrile under high pressures, you'll bring molecules together and see it reacting with itself, and eventually, it forms either a solid yellowish polymer or, as we found out, a black, carbon-rich material," Ivanov said. Acetonitrile is one of a number of organic compounds that have been discovered in outer space and is thought to be implicated in the origins of simple amino acids, one of the basic building blocks of life. In a cosmic event such as an asteroid collision, the pressures and temperatures generated can be very large, and in the presence of acetonitrile they could mimic the experiment the researchers conducted at SNAP. The formation of the yellowish polymer was the expected result of the SNAP experiment, explained SNAP instrument scientist Chris Tulk, but a surprise was just ahead. "When the sample was depressurized and the pressure cell opened, ammonia was detected. It has a very distinct scent," Tulk said. "We thought, 'there shouldn't be ammonia in this sample right now'. So we started looking for what could have happened to first form, and then release, ammonia." This led the researchers to collaborate with experts in advanced electron microscopy, materials science and computing to understand the mysterious results. Based on a combination of computer simulations and microscopy, they concluded that nitrogen had left the acetonitrile sample, leaving behind an enriched carbon-based material. "The carbon material that was left was imaged using our best electron microscopes," Ivanov said. "It had onion-like layers – one shell of carbon sheet after another. So nitrogen went somewhere, but where did it go? It escaped in the form of ammonia gas." Because a temperature-based catalyst is usually required to convert a polymer into another material, this ability to cause a chemical reaction through pressure alone is unusual. "I wanted to continue doing these experiments to determine how much we could control the structure of a carbon material through pressure, not temperature," said Ivanov, comparing the experimental conditions with those found in household pressure cookers. "In most cases, pressure cookers still use high temperatures to help foods cook thoroughly. But with our experiments, we've been able to use a sort of pressure cooking at room temperature, albeit at much higher pressures." While a pressure cooker operates at pressures of 0.1 megapascals, these experiments used much higher pressures – up to 23,000 megapascals, which corresponds to the pressure found 650km below the Earth's surface at the boundary between its upper and lower mantle. "This paper is truly exciting for us," Tulk said. "Using this process with the addition of oxygen, possibly by the addition of carbon dioxide or water into the reactants, complex carbon structures similar to the kind we suspect throughout early formation of amino acids on Earth may be realized." The researchers note that cross-disciplinary expertise in neutron sciences and nanoscience, together with the Energy Frontier Research in Extreme Environments (EFree) Center, a DOE Energy Frontier Research Center, made the research possible. "One without the other seemed like a one-sided mission. Two aspects of research, structure and functionality, were brought together through the synergetic work. Through joint efforts like this, we continue to help users drive the discovery of new materials and new functionalities," Ivanov said. This story is adapted from material from ORNL, with editorial changes made by Materials Today. The views expressed in this article do not necessarily represent those of Elsevier. Link to original source. Tiny balloons made from graphene can withstand pressures higher than those at the bottom of the deepest ocean. Mitsui, Toray and Hexagon Lincoln have proposed a joint venture to make FRP hydrogen cylinders. Scientists have developed a novel form of glassy carbon that is a ultrastrong, lightweight, elastic and electrically conductive.